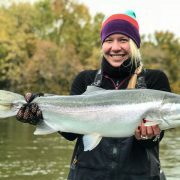 Nice part about battling the big boyz of the 2013 fall steelhead with the streamer rod, is that you can battling them with 12-15 pound test tippet. Pictured below is Robert from OK with the largest steelhead landed so far with a streamer. Great fish Robert. Would guess the fish to be 14-15 pounds.